For many years, tile has been the flooring of choice for high-traffic buildings and places of significance. The beauty and longevity of tile makes it the perfect choice for homeowners who are looking for durable, low-maintenance flooring that looks good, too. Visit our showroom today to take a look at our impressive selection of tile flooring in Bel Air, MD. With so many types to choose from, you are bound to find the perfect flooring for your home. If your floors no longer make you happy, it’s time to shop our store for an update. No one wants to live with dingy, worn out, or out-of-style flooring. We make it easy by offering a large selection of great choices in ceramic floor tile. If you are tired of breaking your back trying to keep your kitchen floors clean, ceramic and porcelain tile is the flooring choice for you. Tile has a dense surface that doesn’t stain easily or allow moisture to penetrate, meaning your floors will look just as good as the day you bought them even 10 years down the road. That is, if you take proper care of them. How does one take care of tile? The answer is actually pretty simple. Occasional dry mopping with a Swifter or other device is enough to keep your floors looking great on a day-to-day basis. When you need a truly deep clean, wet mopping is all you need to bring back that like-new shine. Love the look of tile, but want something a little more sophisticated? Look no further than stone floor tile. 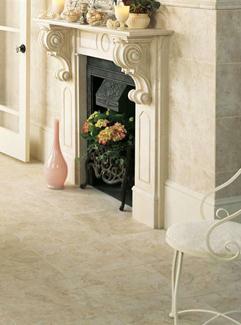 Cut from natural stone deposits, stone tile gives your home a high-end look that is uniquely your own. No two stone tiles are exactly alike, meaning no two stone tile floors will be exactly alike either. Whether you are looking for natural materials or manmade ceramics, it is important that you invest in a proper installation. Tile is amazingly durable and impact resistant if installed right, but if the subfloor isn’t perfect, you could easily crack or chip a tile on accident. That is why you should turn to our experts for tile flooring installation. We make sure the job is done right the first time. Contact us to order quality tile flooring. We serve residents of Bel Air, Fallston, Forest Hill, Abingdon, and Kingsville, Maryland, as well as the surrounding communities.